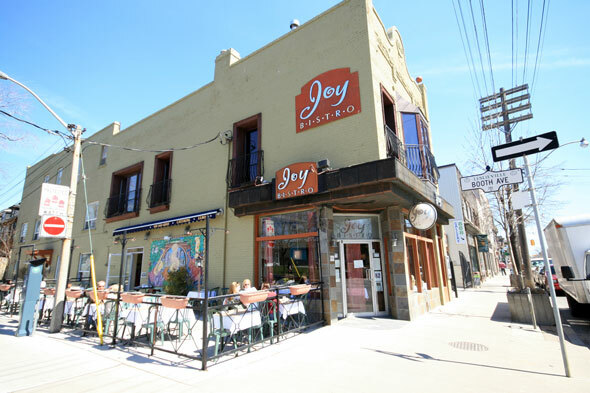 The relaxed atmosphere at Joy Bistro, a popular Leslieville restaurant on Queen East, is immediately welcoming. Chef Bryan Burke's menu, offering French and Italian techniques with Ontario ingredients, is equally inviting. The restaurant is well conceived, with great care taken to prepare a limited menu of the chef's best offerings, changing every six weeks, and supplemented with a chef's tasting menu, changing twice weekly. Some items, such as beef tartare with watercress and soft boiled quail's egg, are clearly the inspiration of a talented chef. 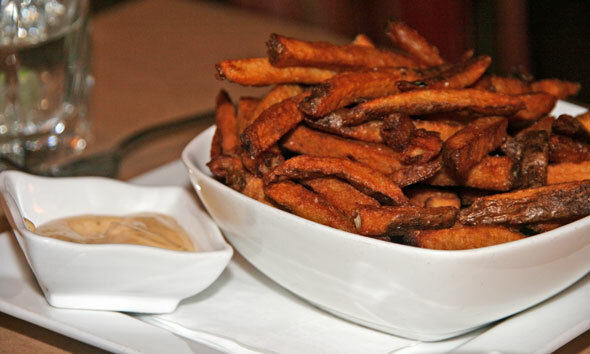 Others are chef Burke's take on classics, such as steak frites. 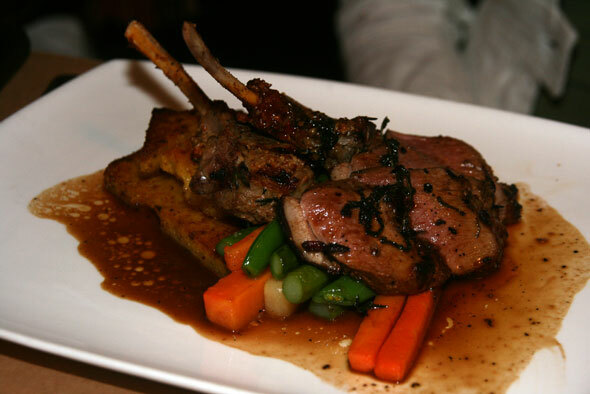 Joy Bistro offers something for the whole family, including options for both the pickier and more adventurous eaters. A nice feature of the Joy Bistro menu is the chef's tasting menu ($35), which offers an affordable way to enjoy three courses. 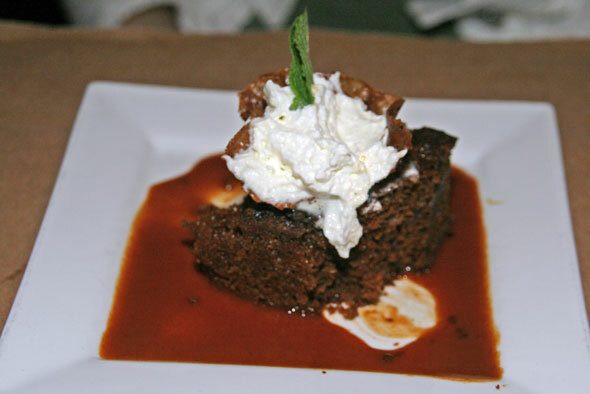 It also begins with an amuse bouche, which on my recent visit was a particularly memorable black bean puree. Of the four of us in my group, two ordered the chef's menu while the others elected for only two courses. In true French style, in order to serve everybody together, we all received the amuse bouche, and while this is certainly not a major thing, it shows an attention to detail and consideration for the guests that is often absent. 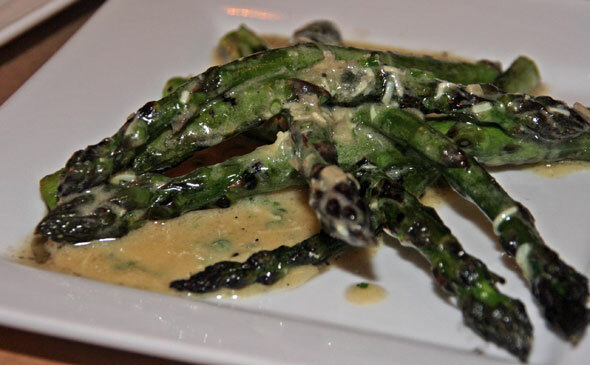 In the appetizer round, the grilled asparagus were the surprise winner, declared "the most perfectly grilled asparagus I've ever had," by one dining companion. The beef tartare had an exceptional flavour, and the generous portion only needed more toasts to be complete (which the server was happy to provide). 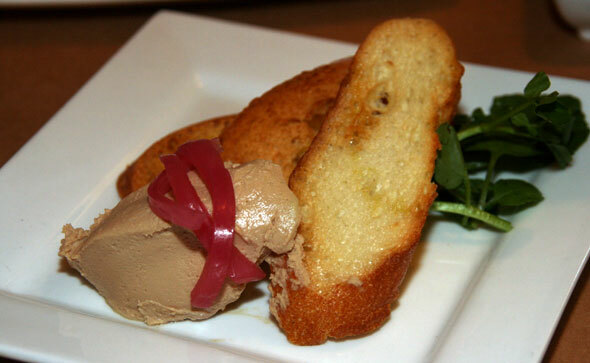 The house made pate was good, nicely creamy, but unremarkable. We were looking forward to the main dishes. The chop and roast of lamb was truly excellent, very juicy and tender with lots of flavour, and was well complemented with rosemary. 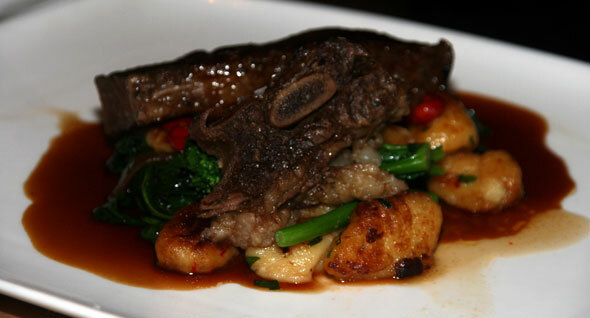 Similar success was enjoyed with the short rib, although it was the only portion size that seemed a touch small. The menu has several vegetarian options, but currently, most include goat cheese. For my vegetarian dining companion who doesn't enjoy goat cheese, this proved to be a challenge, although she inquired about the possibility of doing the risotto sans chevre. After checking with the chef, the server said it would be no problem. 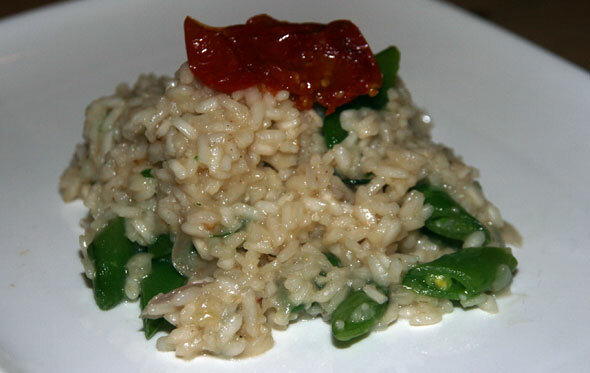 Unfortunately, the risotto wasn't very good, as it was extremely bland. I'm sure it would have been much better with the goat cheese, but the chef shouldn't make it without the goat cheese if it isn't going to be good. Substituting an alternative cheese would have also been nice. While all of that is not a big knock against the restaurant, the biggest hole in Chef Burke's menu came with the hanger steak main. 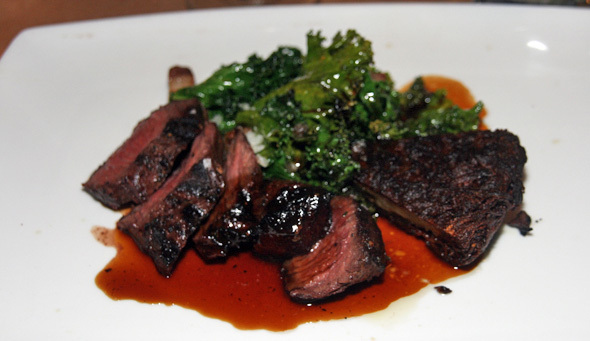 The steak itself, cooked perfectly to medium rare (the server made it clear this cut just gets tough if cooked too long) was delicious and the house made bacon added a luxurious richness to the kale. However, the potato rosti was potato toasti, completely, unappetizingly burnt. This error was troublesome for two reasons. First, it shouldn't have been burnt. Whoever's on the line should be able to cook a potato rosti correctly every time. Second, and more troublesome for me, is that it should never have been served. It was obviously burnt (it's obvious in the picture), but none of the staff noticed: the cook, whoever plated and the server. Whoever clears dishes for serving was asleep at the wheel, which is too bad. The restaurant had also gotten busy, and the attentive service became inconsistent; flagging down our server to mention something about the rosti proved a challenge, and ultimately, it just went back to the kitchen with the otherwise cleaned plates. Desserts were average for us, with the best being a chocolate torte with peanut butter ice cream, which I would have gladly taken a big bowl of. Another dent in the armor, the chantilly with the rhubarb sponge cake was borderline burnt, which the two baking fiends in the group immediately noticed. Ultimately, we had a great meal. The wine list is thorough and, like the menu, quite affordable. Some interesting options are available by the glass, and the bottle list offers a nice selection at $40 and under (along with some pricier options). Joy Bistro brings an upscale flair to a solid neighbourhood restaurant. Chef Burke has a lot to be proud of, and could take his preparations and presentations to many of Toronto's starred restaurants. That he spends his time turning fresh Ontario products into enjoyable and affordable meals in Leslieville is a bonus for neighbourhood residents, who are obviously happy to fill the restaurant. And that's what this restaurant is really all about: good local food at very fair prices. All photos by Joshua Tusin except exterior view by blogTO staff.